Home Uncategorized So You Wanna Be A Cicerone? I sat in the nameless coffee shop nervously blowing on a cup of coffee and waiting. I hadn’t taken a test of any import in over a decade, and I’d forgotten how anxious I would get before exams in college. I half-heartedly flipped through my deck of beer flashcards, and carefully sipped from my hot coffee. The last thing I wanted to do was burn my tongue before taking the beer tasting portion of the Certified Cicerone® exam. What does it take to be an expert in beer? Can anyone with a passion for craft beer, a box of special bottles stashed in a closet, oe a few batches of homebrew under their belt call themselves an expert? I viewed beer as something special, and became dedicated to helping craft beer find a foothold in Los Angeles, but was I an expert? I decided I needed some external validation. That’s when I turned to the Cicerone Certification Program. These days, beer is serious business. Beer lists are no longer after thoughts assembled by beverage managers more focused on wine and cocktail programs, and beer industry veteran Ray Daniels saw the need for a formal certification process that could help businesses and their customers feel confidant that the people selecting, storing, and serving craft beer were indeed experts. Daniels began the Cicerone Certification Program in 2008 (the name comes from an outmoded term for a particularly knowledgeable museum guide) and created a new class of beverage specialist. 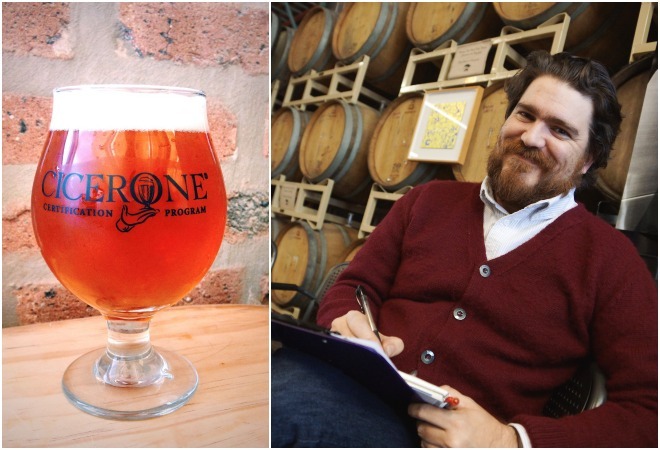 Simply put, the Cicerone is the beer-world’s Sommelier. The program itself is broken into three tiers. The most basic —Certified Beer Servers®—must pass a $69 on-line test that covers basic beer knowledge, styles, and service details, while only seven people have attained the highest level: Master Cicerone®, which requires passing a rigorous two-day, $695 test that covers an overwhelming amount of beer minutia. I had ponied-up my $345 for the Certified Cicerone® exam, and would need to score at least 80% on the three-hour exam of short-answer and essay questions and a three-flight beer tasting. I’d spent the six previous months “studying” for the test by semi-methodically tasting my way through the 50+ covered styles of beer, reading books about beer, and then tasting yet more beer. I’d volunteered to help a local taproom clean out their taplines (an arduous process requiring caustic acids and a considerable amount of scrubbing), and sat through hours of workshops on “off-flavor tasting” where I sampled perfectly good beer that was doctored with the flavors that can result from errors or mishaps in the brewing process. (The jury was out on whether the most offensive off-flavor presented was “baby vomit”, “wet goat”, or “musty cellar”.) I hosted tasting parties where friends would gather to help me taste and talk about esoteric styles, experimental food pairings, or (the dreaded) box of old beer. The week before the test I descended into full-on cram mode the likes of which I had not seen since my misguided years at UC Santa Cruz. Flashcards were drawn up, and I drilled the stats of each beer style the way a ball-loving kid reads baseball cards on a rainy afternoon. I reread the best volumes from the extensive beer book library I’d assembled (Tasting Beer by Randy Mosher and The Brewmaster’s Table by Garrett Oliver, most notably) and fretted over if I should take allergy medicine on the day of the test and risk drowsiness, or skip it and hope I wouldn’t be congested. It all came to a head on a breezy Monday morning at Long Beach’s Beachwood BBQ & Brewing, where a dozen candidates sat for the exam. I recognized a few faces from beer bars or bottle shops around town, but there was no small talk as our proctor went over the process and handed out the thick sheaf of test questions. The written test went about as expected, a flood of short-answer questions that covered the ground from general beer knowledge to shockingly specific details. The essays were straightforward questions about the history and qualities of specific styles. The most challenging aspect of the test, the tasting flights, came last. Three flights would each test a specific skill: style differentiation, where the taster must determine if each sample is, for example, an English pale ale or an American pale ale; service acceptability, where four beers are presented to determine if they are fit for service from a bar; and the dreaded off-flavor flight where tasters must determine what, if any, off-flavors are present and what could cause the issue. The first two flights were challenging, but the off-flavors portion was particularly befuddling. There was much sniffing, swirling, and tasting of the samples until the clock began to wind down and the sample pours were drained from their plastic cups. After all the candidates were finished the proctor led us in a brief discussion about how each tasting flight would be scored—an unexpected bonus that helped reduce the anxiety of waiting for test scores for the next few weeks. I’d done better than I expected to on the tasting flights, and I felt my written test was very strong. About eight weeks later (while I was shopping in BevMo of all places) my gut feeling was confirmed when I received an email from the program informing me I could officially call myself a Certified Cicerone® (and that the certificate and lapel pin was in the mail). I hooted as quietly as possible and immediately picked up a brace of celebratory bottles. I swelled with pride; life as a thirty-something is not exactly filled with such distinct accomplishments. There’s career, family, and that bank account balance, sure, but it had been a long time since I’d set such a concrete goal to work towards. While the certification has no immediate upside, it did attest to my knowledge of—and passion for—beer and the vast, wonderful culture that goes allow with it. Plus, I’ve also never had so much fun studying.